Built on a sheer granite cliff at the head of the Portes du Soleil, Avoriaz is famous for its wood clad buildings in award winning architectural style and high altitude ski-in ski-out accommodation. Avoriaz is linked to Swiss resorts via the legendary 'Swiss Wall'. When will it snow in Avoriaz? 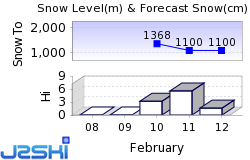 There is currently no significant snow in the 7-day forecast for Avoriaz. The French Ski Resort of Avoriaz is part of the Portes du Soleil ski area with access to 400km249 miles of downhill skiing, with 285 marked pistes, served by a total of 196 ski lifts. 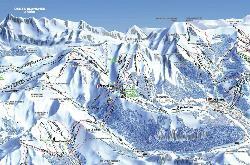 In addition to the skiing in Avoriaz itself (650km404 miles of pisted ski runs), the appropriate ski Lift Pass will allow you to ski or snowboard in the other Portes du Soleil ski resorts of Abondance, Châtel, La Chapelle d'Abondance, La Grande Terche, Les Gets, Montriond, Morzine, Saint Jean d'Aulps, Champoussin, Champéry, Les Crosets, Morgins and Torgon. The ski resort itself is at 1,800m5,906ft, so skiing or boarding back to the resort is usually possible. With ski lifts as high as 2,280m7,480ft, snow cover is generally reliable. Sitting on the border with Switzerland, at a snow-sure altitude, car-free and in one of the largest lift-linked ski areas in the world, it has a lot going for it. From a great distance it can be seen standing out against the white mountains but, because its style is so important, it appears more as a sculpture than a sprawling resort. Nearer to it, the effect changes to tall angular buildings that shine gold in the sunlight and right up close you realise that this isn't an especially hi-tech construction, the buildings just being clad in natural local red cedar wooden slates with plenty of glass, giving it a rather warm feel. The buildings are supposed to blend in to their natural environment, and in a way they do, although it should be stressed that the resort is well above the tree line on a vast snowy plateau. Avoriaz has its own TV and radio channels broadcasting events information and snow reports in several languages including English. The most difficult run is the 'La Combe du Machon'. At the start of the day everyone in Avoriaz piles out of their apartments and gets on to their skis - it's a surreal experience, rather like 'rush hour' in a town or city but everyone in ski gear and sliding. The place is so well designed that there's rarely a walk involved to reach a lift and, if the bottom of the lift you want to take is above you, you can just ski down to the bottom of the six-seater chair that runs through the village and get a lift up to the top first. As you are in the centre of the Portes du Soleil you have a vast choice ahead of you every morning. This is in one respect the 'largest lift linked area in the world' with 650km (407 miles) of trails. On the other hand this claim isn't quite as solid as the other area that makes it - the Trois Vallées - which only claims 600km (375 miles) but does have it all totally linked, whereas at a few key points in the Portes du Soleil you may have to slip your skis off and hop on a bus to make a link. That's all rather petty though really, because the terrain is vast by any means of measuring it and the snow record is good, helped by the proximity of Lake Léman which seems to pull in some of the best and most regular snow in the region. So the first choice of the day, if you want to bother deciding, is whether to stay local or perhaps take a tour. Various routes (shown on a special 'Ski Links' trail map) are possible. Sign-posted 'Discovery Circuits' have also been introduced giving lift-served routes for different ability levels around the area which steer you towards the least congested slopes according to the promotional blurb. The major directions include the hop over the nearby border in to Switzerland and then on to Planachaux, Les Crosets, Champéry and Champoussin. Secondly you may choose to head down to the picturesque and wooded slopes above Morzine and Les Gets, or thirdly you can instead head down towards Châtel, with its own border link over to Swiss Torgon and then back over to La Chapelle. There are many variations and full day circuits can be put together. Avoriaz is a good choice for all levels of skier. Beginners have wide sunny slopes right by the resort and, because of its altitude, the slopes are snow-sure for the whole season. The ski schools are all highly thought of with the Ecole du Ski Français (ESF) and the International Ski School both operating in the resort. Intermediates have the best of all worlds with 240km (150 miles) of blue and red trails in the Avoriaz-Morzine sector alone. The tours to further sectors of the Portes du Soleil are perfectly achievable for intermediates of moderate ability (able to tackle reds) so it's a great place to try exploring. Experts have more than 20 black trails to choose around the domain including one of the Alps most famous - The Wall - a vast steep mogul field that is effectively the border with Switzerland. Most skiers coming from Avoriaz in to the Swiss sector take the chairlift down this slope. The Jean Vuarnet World Cup Downhill Run is also highly regarded. The two main ski schools and the Free Ride School host full day off and on piste tours including ski touring with mountain hiking. These schools are also happy to teach the other sliding disciplines practised in Avoriaz, such as Telemark, Skwal and maybe even Mono! Cross country skiers have 47km of trails through some beautiful mountain and forest scenery. One of Europe's leading snowboarding destinations, Avoriaz offers a good mix of both purpose designed parks and natural attractions. There are two permanent snow parks with an equally permanent superpipe (120m long, six metres wide), so you don't have to worry that lack of snow may mean lack of facilities as at some other resorts. As well as tube barriers, tables and raised bends. One of the parks, Chapelle, is especiaslly for beginners. There are three snowboarding schools in total, including the 'boarding only' Emery school which offers an equipment-inclusive package. A special top value limited area snowboard Pass is offered by the resort for those who want to concentrate on the snow park rather than clock up a lot of piste kilometres. To underline its status as a major 'boarding mecca, Avoriaz has a rare special area for child 'boarders. Village Snowboard is reserved exclusively for kids aged 6 to 16 at all levels. We don't currently have confirmed season dates for Avoriaz. NOTE:- Lift and Piste openings are always subject to Snow Conditions in Avoriaz. Avoriaz is able to make snow, on 11km7 miles of ski runs, with 68 snow cannons. The 35 ski lifts of Avoriaz are able to uplift 47,000 skiers and snowboarders every hour. Avoriaz is in the French Alps in Portes du Soleil, Haute-Savoie, France. The nearest airports to Avoriaz are Geneva, Sion and Annecy. There are eight airports within three hours drive. The appeal of Avoriaz to a younger international crowd shows in its usually lively après ski scene. Along with the restaurants there are ten bars which include a pub and a piano bar; there's also a live music bar and a night club. The Place and Wild Horse Saloon are good for live music, and for nightclubbing Le Yak. La Cabane and the Globetrotters Bar are also popular. The Studio 9 Bowling Alley remains open until 2am - it has two bowling alleys, pool and video games as well as a bar. Skating on the floodlit ice rink is also available and there are two modern cinemas with Dolby digital stereo systems. It's quite a popular option for skiers to end the day in one of the Portes du Soleil resorts, check out the nightlife there and take a late night taxi back up to Avoriaz. Avoriaz represents a break-through in modern resort design. While ski centres in the 1960s were being 'thrown up' or developing in areas of great natural beauty in France, Italy, Switzerland and North America, Avoriaz was arguably the first to consider the importance of architectural design. Two aspects of design also - firstly the layout plan, secondly the architecture. Built on a cliff edge above the already successful French resort of Morzine, Avoriaz still seems 'space-aged' and unique 40 years on. The architects created a large square in the centre of the resort and put a children's tobogganing slope in the middle. At one side of the square there is an open-air ice rink, on another a festival hall. The resort is designed so that all accommodation is slope-side with access over snow only. Other popular Ski Areas near Avoriaz. Want to ask about skiing and snowboarding in Avoriaz? Or contact Avoriaz Tourist Office. Note :- The information on J2Ski concerning Avoriaz, where not clearly factual, is opinion only and is neither definitive or exhaustive.